I’m going to start this column out with a confession. Every time Siri does something wonderful for me, I start to say "Thank you." I know she—it—is just a machine, but the impulse is there. Maybe it goes back to my childhood when I knew if I didn’t say please and thank you I would get slapped up side the head. This whole issue came up because Siri has developed to the point that it can do all kinds of things that make the average user's life better. The new skills that are available through iOS 8 are so advanced that even someone like me, who isn’t out in the business world every day, can still take advantage of it’s options. For instance, I can sit in my easy chair, cook book in hand, and compose a shopping list just by telling Siri to create it. I can also ask Siri if my favorite TV show has started a new season yet. Oh, and if you do tell Siri "Thank you," she will respond with, “I’m just doing my job” or “My pleasure, as always”. 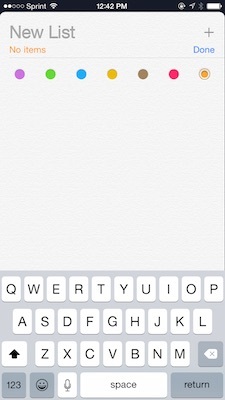 Following are a three tips for Siri in iOS 8. I have loved using Shazam since it first came out. Shazam allows you to hold your iPhone up to any music, and almost every time it would tell you what was playing. 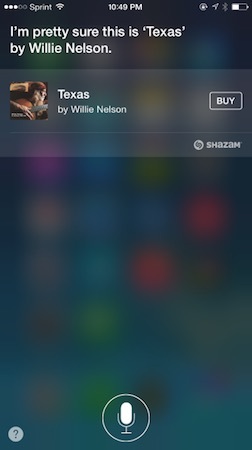 But in iOS 8, Apple incorporated Shazam's technology into Siri, making it even easier to find out the name of that song. Hold your phone close to the music source, activate Siri and ask what song is playing. Siri tells you the name of the music, the album it comes from, and, if it is listed in the iTunes store, offers a buy button. You don’t have to even open the Reminders app to add things to it. Siri will do it for you. A little setup helps. 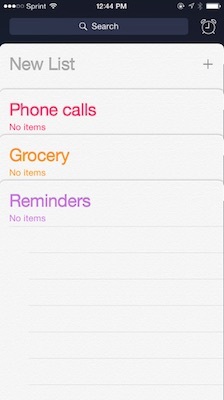 You can create categories ahead of time so that your reminders go where they will be the most useful. At the top you will see the option for adding a new category. Click on the + sign. 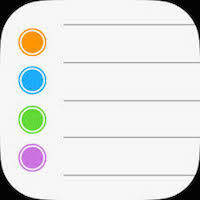 Now name your list where it says “New List” and pick a color choice by clicking on the color circle. Create as many as you want. 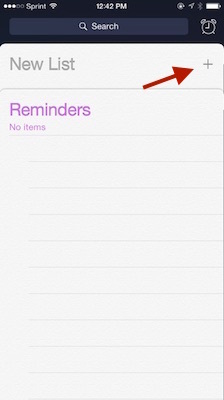 The generic Reminders is included as part of the app. ▪ Me: Add get bleach to my Grocery list. ▪ Siri: Alright, I will add get bleach to your grocery list. ▪ There are two numbers for Linda Craig. Which one do you want. ▪ Me: I touch the one I want. ▪ Me: remind me to call Linda Craig on Thursday at 11 am at her home number. ▪ Siri : Here is your reminder, shall I create it ? These items will be listed under Reminders. Say you want to tell Siri to call your husband whose name is Tom. There may be lots of Toms in your Contacts list. You can tell Siri to call him using his first and last name, assuming his name is easy to pronounce. You can take the time to train Siri to recognize that last name, but there is a faster way to tell Siri exactly who you want, no questions asked. You do that by assigning a pet name to your special Tom. First, the person under consideration must be listed in your Contacts along with their phone number. To have Siri recognize your specific Tom, hold down the home button until Siri appears. 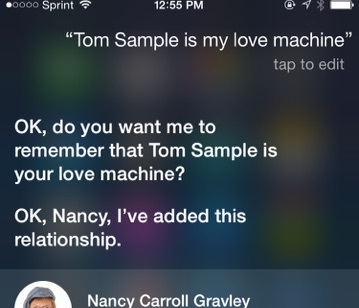 In a strong voice say “Tom Sample is my love machine.” You may have to correct Siri a time or two until she gets it right. When she does, grant permission for her to apply the new term. Very Import: You have to word your request precisely by saying “person is my xyz.” I went crazy trying to make this work until I figured out the necessity of putting the word my in front of the nick name. Here is another thing I learned the hard way. If you try to say something like “Tom Jones is my son,” Siri wants to use “Tom Jones is my child.” I have more than one child so that doesn’t work. Siri and I argued about that for quite some time, but in the end Siri won. My guess is it has something to do with other programming in Siri. As soon as I picked another identifier it worked perfectly. I've covered three new features for Siri in iOS 8 - Using Siri to identify music, using Siri to create reminders, and creating specific identifiers from your Contacts list.